Charlie Chan appeared in six novels by Earl Derr Biggers published from 1925 to 1932. 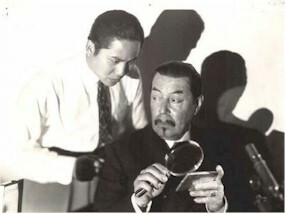 The first three novels were each adapted to film during the 1920s by different studios with George Kuwa, Sojin, and E.L. Park playing Charlie Chan. The best-known Charlie Chan movies are those of the long-running series that began in 1931 with Charlie Chan Carries On, starring Warner Oland for Fox Film Corp. Oland starred in a further fifteen Chan movies, up to the time of his death, after which the mantle passed to Sidney Toler. By this time, Fox had merged and been succeeded by 20th Century Fox, which produced eleven more Charlie Chan films through 1942. Toler then bought the screen rights himself, and arranged a new series for Monogram Pictures in 1944. Monogram made another eleven Chan films starring Toler and then six starring Roland Winters after Toler's death. The progression of Chan films from Oland to Toler (under the two incarnations of Fox), and especially to Monogram's films (whether with Toler or Winters), involved lower budgets and variable scripts, and generally less modern respect. I just purchased an autographed Frank Sinatra photograph and I am extremly happy with my transaction, and Kevin was great professional to deal with.